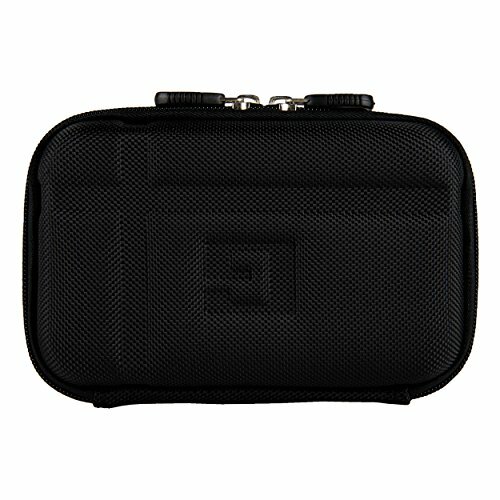 Keep your Garmin Devices safe and protected with VanGoddy's Hard Shell EVA/Nylon Carrying case. This robust and durable case is made from the highest quality EVA and tightly woven nylon to keep your device safe from bumps, scrapes, scratches and falls. The exterior features a dual zippered closure that keeps your device from falling out. Included is a carabineer for attaching to the back of the case making for the ultimate traveling convenience; the interior features microsuade lining guaranteed not to scratch or harm your device. The interior is also appointed with a mesh pocket ideal for charging cables and such while the device compartment itself features two polyester bungee straps for keeping your device from sliding around. With its simple and practical design what more could you ask for in a protective GPS carrying case? Try out ours today and experience ample protection with uncompromised style.